Ahead of our opening fixture against Norwich we spoke to Gary Gower, the Editor of “Norwich City – My Football Writer“, to get their views on Everton, Norwich City and the new Premier League season. Q.Norwich have been busy in the transfer market, which of the new signings are you particularly excited about? Ricky van Wolfswinkel is the signing that’s come with most bells and whistles and we’re hopeful that him and Gary Hooper will add a goal threat that was missing for much of last season. With Grant Holt no longer of this parish there’s an expectation that, between them, they will fill the 15-20 goal a season void that Holty in his prime used to offer. Q. Leroy Fer almost joined Everton in January, but the deal fell through for medical reasons. What are your hopes for Fer? How has he settled in? Are there any concerns over his long-term fitness? Fer has looked quality in pre-season and comes with a more than decent reputation. Described by some (well me actually) as a raw version of Patrick Viera, we’re hopeful he’s going to add some quality to a midfield of workers and grafters. In terms of his fitness, I imagine his City medical was fairly rigorous, but then again we did take James Vaughan – and his knee is made of cheese – off your hands a couple of seasons ago! Q. Norwich appeared to find last season more difficult than the first year back in the Premier League, why do you think that was the case? I detest the term ‘second season syndrome’ but it’s hard to argue against. The stats tend to prove the second season back in the Prem is harder than the first and we’re living proof of it. There were other factors too, notably the first season under Chris Hughton which brought with it a different playing style. Overall, we were happy though and, in fact, ended the season one place higher than we did with Paul Lambert in charge. Q.How has your pre-season gone? In terms of results, not great so far but with it mainly being an exercise in fitness I have little time for those who get mardy because of a defeat or two in a friendly. With seven new faces and counting, Hughton has been a busy man over the summer months and has definitely improved the squad in terms of quality, but time will tell if they can ‘hit the ground running’. Q. What are your hopes for the new season? Without wishing to sound too poncy (although I’m about to) we’re looking for continued improvement, which – in City terms – is a place or two higher. If we can avoid the relegation free for all that, in itself, will be a degree of success and a cup run would also be a welcome bonus. I’m predicting 10th. Q. 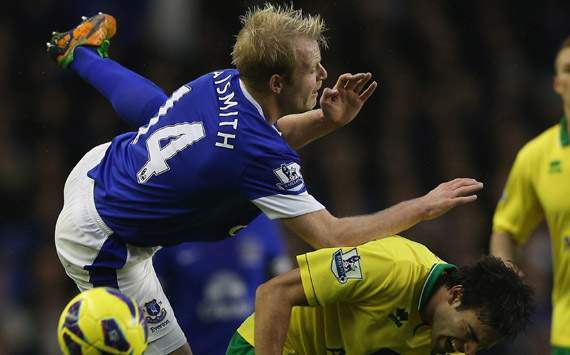 Last season Norwich did very well against Everton, sneaking a point late on at Goodison and then scoring two late goals against the Blues at Carrow Road to earn an important victory. What were your thoughts on Everton last season? In fairness you snatched defeat from the jaws of victory at Carrow Road. Having pretty much dominated the game we caught you with two late sucker punches. Overall I thought you did well, although minus the massive cash injection that Bill Kenwright seems to be forever searching for, it’s always going to be hard for you to gatecrash the top five. In my view David Moyes had moulded a side that was pleasing on the eye and methodical in its approach. Q. We are under a new manager for the first time in 12 years, what are your thoughts on Roberto Martinez? Not an easy job – especially after the good one that Moyes did – but Martinez appears to be a thoroughly decent bloke who’ll get you playing some attractive, passing football. Although it seems to have been forgotten, it was he – not Brendan Rogers – who started the ‘Swanseaola’ revolution and if he can get you playing in that same style I reckon you’ll grow to love it. Q. Where do you think Everton will finish this season? Hopefully 6th, one place above you know who. Q. Which Everton player do you most admire? Leighton Baines is the obvious one; everyone loves a full-back who ‘bombs on’, and with a left foot that can open a tin of beans he always looks a constant threat down your left side. Fellaini is another one who is always a handful to play against; his performance in your early victory over Man Utd one of the best individual performances I saw last season. Q. Player of the Year? Q. What is your score prediction? Q. What do you expect to be the Norwich starting XI? Q. Who should we look out for? Next Post Everton’s worst ever manager?